This practical handbook offers advice on strategies for meeting the special educational needs of children with Down's syndrome in mainstream schools. The aim is to increase the confidence of support assistants, teachers, SENCOs and senior managers in both primary and secondary schools in providing a quality education for these pupils, while using scarce resources to best effect. 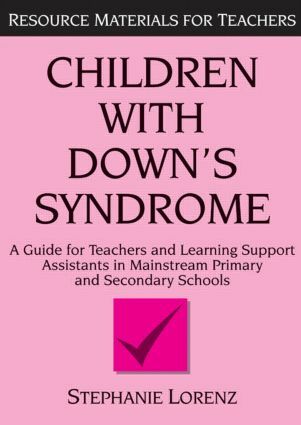 The author offers an introduction to the particular characteristics of children with Down's syndrome and their impact on learning and behaviour. She considers the benefits of inclusive education and the most effective ways in which the National Curriculum can be made accessible. She also examines working with the whole-school, parents and outside agencies, as well as providing practical resources such as photocopiable proformas and checklists, materials for INSET in schools and support services and a list of reading materials.